This is a 5.5 inch Super AMOLED phablet with a resolution of 2560 x 1440 pixels and a pixel density of 500+ ppi. Inside the Note 4 we find a Snapdragon 805 2.5 GHz processor and other specs include LTE Cat 6 Support and an S Pen stylus with updated gestures and air command. The device uses 3 GB of LPDDR3 RAM, it has dustproof and waterproof capabilities and runs Android 4.4.3 out of the box. There’s a 16 megapixel ISOCELL camera at the back with 4K video recording. 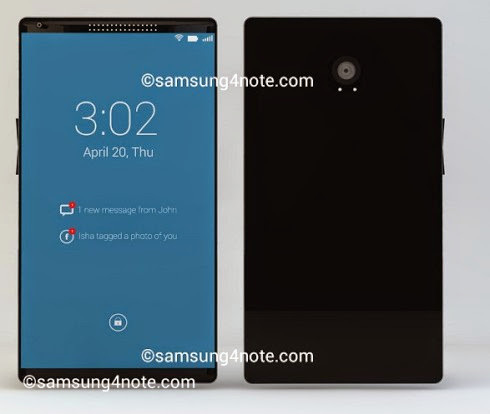 A quite ugly concept render of the Samsung Galaxy Note 4 if you ask me. And the buttons on the side seems to be made for one hand handling of the phablet, and I can't see that being practical at all on such a huge device. I also wish Samsung would be using such lock screen but they won't, I'm sure of that because TouchWiz will never be as minimalistic. Samsung needs to do something about the ugly design of the Note series that's for sure, but this is not it.